When you’re searching for estate jewellery, you’ll quickly learn that there’s a lot of value in authentic pieces. The strict definition of an antique is that it must be at least 100 years old, and preferably in excellent condition. That isn’t always followed in the world of jewellery, unfortunately, so savvy buyers need to learn some tricks to help identify whether a piece is authentic or not. Here are some clues that buyers from Cynthia Findlay Antiques recommend for the average estate sale shopper. First, learn what metals were used in the manufacture of the ring. This is your first clue as to what era the ring belongs to and that leads to a rough estimate of age. If the ring is platinum, you can guess it originated in the early 1900s. If it contains platinum, it could date earlier, as the metal was often mixed with gold or silver before the 1900s, when manufacturing had developed a process to work with it in fine detail. Look at the stones as well. Art deco rings favor pearls, sapphires and onyx settings in addition to the traditional diamond settings you’ll often find. Buying from an estate is fun, but it’s also risky if you’re really looking for a piece of value. You don’t really know, unless you’re a certified appraiser, even with the clues provided. Those are just guesses, or aids. 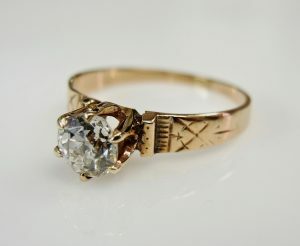 Buying from a certified dealer removes all doubt that you’re buying antique engagement rings and not fakes. If you’re nervous about overpaying for a ring, consider buying from a dealer. It’s a better, and safer, way to find something you’ll treasure.